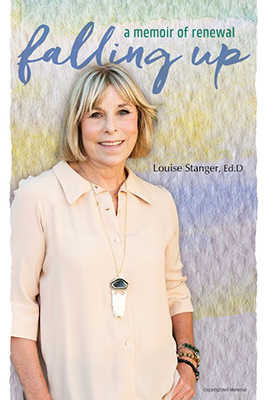 After more than 30 years of work helping people with addictions, renowned intervention specialist Dr. Louise Stanger is sharing her own story in her book, FALLING UP: A Memoir of Renewal. After more than 30 years of work helping people with addictions, renowned intervention specialist Dr. Louise Stanger is sharing her own story in her book, FALLING UP: A Memoir of Renewal. Her remarkable narrative details her journey through a myriad of trauma, loss, and hardships. She illustrates the many challenges she has faced, including losing her son to SIDS, guiding her daughter through substance abuse recovery, and becoming a widow in her forties. Dr. Stanger weaves her trials and tribulations among snippets of hope and optimism. Despite a plethora of unspeakable adversities, she nevertheless always seems to find the light and sanguinity in every situation. In fact, that is the very premise of Falling Up. No matter what the odds may be, Dr. Stanger proves that transformation and renewal are possible. Her inspiring insights and lessons will undoubtedly motivate readers to look further into their own lives and find ways to thrive. As Dr. Stanger’s story exemplifies, people may fall down at times, but holding fast onto strength and conviction can lift anyone upward. Dr. Stanger’s powerful memoir dives deep into the intrinsic trials of recovery from a host of life’s toughest challenges. She demonstrates resilience, and in doing so, exemplifies the hope and tenacity of the human spirit.